In November 2018, we shipped a 40ft container over to Sidinda, which was a key fundraising objective for 2018. This shipment is momentous for the region, covering two schools - Sidinda Primary School and Lumbora Secondary, the Sidinda Health Clinic and possibly two further clinics. The potential retail price of the contents of the container is approximately AUD $100,000.00 and will go such a long way in the community. The container was unpacked on 2 February 2019 with great success! Alison Hull, Malcolm Hull, Liz Richardson, Bruce Richardson and Viv Desmarchelier for their packing efforts. The Days for Girls program generously donated 400 reusable sanitary kits for the women and children of Sidinda. Sanitary items are virtually inaccessible to remote women and children in Zimbabwe due to their cost. The DFG kits will ensure that women and children are not missing out on education and work. They are a sustainable sanitary option that provide each user with three years of sanitary care. To find out more information, please visit their website. $2,000: Training of 2 extra ECL staff for Sidinda. In total, we are fundraising for $50,000 in order to educate over 300 children across the two schools. We would like to further extend our Bursary Program to more students as the ability of families to afford secondary education is dwindling in the face of the poor economic situation in the country. 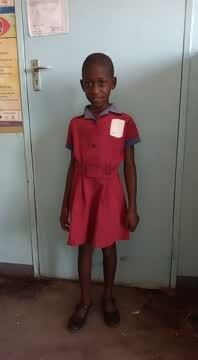 The cost of the educating a child through Secondary School is approximately USD $130 per annum, which includes uniform, shoes, satchel and text books. Pictured above are the desks and chairs donated by DIK Rotary and delivered to the Lumbora Secondary School and Sidinda Primary School. These students have not previously had functioning desks and the students look very happy and eager to learn! Sidinda is a small tribunal community located in rural Zimbabwe. It is dependent on subsistence farming in a ravaged economy with 90% unemployment. The Sidinda Health Clinic was built and completed in December 2012 to accommodate a population of 5,000 community-members. Prior to the construction of the clinic, the community had to walk 25 Kilometers to receive medical support. Alongside the Clinic is the Sidinda Primary School which is responsible for 120 school-children under the supervision of 1 teacher and 2 volunteers. They are the only substantial buildings for the village. We are the only financial support the Clinic receives currently, with the government failing to pay the Nurse's wage and medical supplies dwindling. Our fundraising efforts concentrate on the promotion of adequate healthcare facilities and we are also turning our attention towards the Sidinda Primary School. Our aim is to work with local council and established institutions to provide consistent monetary support and to upgrade the minimalist facilities at present. Michelle and Ellen Leishman fundraise through various means, involving the community and aimed at empowering the community and especially the women of Sidinda. We always welcome donations, as the Clinic requires ongoing medical support. Unfortunately, our website provider only uses Paypal as a medium. Please use the website enquiry function or email us at sidindahealthclinic@gmail.com to request banking details if needed. Follow the link below if you would like to donate. Sidinda Health Clinic is an incorporated association registered with the Australian Charities and Not-For-Profits Commission. We are also a 'Deductible Gift Recipient' and endorsed by the ATO. If you wish to double check this status, please visit the Australian Business Registrar's ABN Lookup function and search for our ABN - 76 434 129 203, which details that we are both registered on the Australian Charity Register and a Public Benevolent Institution endorsed as a Deductible Gift Recipient. The Term 1 students are busy fundraising and cycling this term to raise funds under the Break the Cycle program. The current figure is very impressive and is helpful in developing an understanding of how children access education whilst living in poverty. The goal for the students is $3,000.00 for an amazing effort of riding 245.5 km in 4 hours on a hilly technical track. Let's show our support for their initiative and effort!